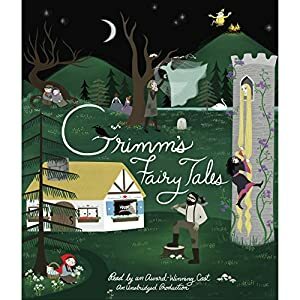 I was fortunate enough to get an advanced listen to this newly produced collection of Grimm’s fairy tales. (These are the original tales, full of violence and betrayal, and not suitable for very young children.) Full of favorite tales like Cinderella and Rapunzel, along with several lesser-known stories, and with such a spectacular cast of narrators, this audio collection is a treasure! I recognized most of the readers’ names, and even more of the voices in this collection. Jim Dale reading Rumpelstiltskin was a real treat, and there isn’t one bad narrator in the bunch. If you are a fan of fairy tales, or have a pre-teen or young adult reader at home who might be, don’t miss this one. NOTE: I received a free review copy from the publisher in exchange for my honest review. All comments and opinions are my own. Would be good to listen to in the car. It was… I listened going back and forth to work!